Whedonopolis is proud to announce that Buffy alumnus and fan-favorite Juliet Landau will be attending San Diego Comic-Con 2015 as our special guest on Sunday, July 12th!! As a Comic-Con exclusive, Juliet will give her fans the first glimpse of the teaser trailer for her vampire documentary, A PLACE AMONG THE UNDEAD. The documentary contains a stellar line-up of interviewees and Juliet will soon be launching an Indiegogo campaign for the project. There will be a brief Q&A following the sneak peek. Then she will introduce the annual closing event screening of the much-loved, Buffy musical episode, “Once More with Feeling.” This event will take place in room 6BCF starting at 2:45pm Sunday, July 12th. In addition, Juliet has created an exclusive, limited edition, pre-campaign UNDEAD perk, available only at Comic-Con! This perk will kick off the fundraising and will make buyers a partner in the film, ensuring a “thank you” in the end credits. It will be available at the Whedonopolis booth (Exhibitor Table B7) during the full run of the convention, but Juliet will signing in person Sunday from 10am to 1pm. For those unable to attend the convention Sunday, she will autograph a limited number ahead of time, so that everyone will have a chance to pick up one of these exclusives! Landau will also be the Guest of Honor at the upcoming Whedonopolis 2016 event next year, on May 13-15th, to take place at the Airtel Plaza Hotel, adjacent to the Van Nuys airport in Los Angeles. For more information and membership opportunities, please visit WhedonCon.org. 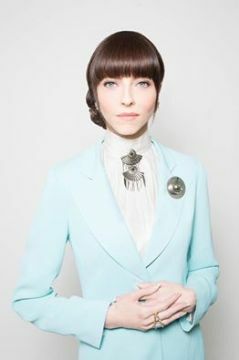 Juliet Landau is the daughter of actors Barbara Bain and Martin Landau. She created the role of Drusilla on Joss Whedon’s Buffy the Vampire Slayer, appearing on Buffy and it’s spin-off, Angel, over the course of six seasons. Ms. Landau studied acting extensively with the late Susan Peretz and is a member of the Actor’s Studio. Ms. Landau directed the short documentary Take Flight about and for Gary Oldman, co-directed and appeared in Godhead’s “Hero” music video and co-wrote two issues of the Angel comic book about her character, Drusilla.